Grab a pen and paper and number it from one to twenty-five. Now list everything you did yesterday. Tomorrow I want you to write down all the things you did today because by tomorrow, today will be yesterday. For an entire week, I want you to write down what you accomplished the day before—which is always a yesterday. After a week of itemizing, go back and circle those things you feel passionate about. Take a hard look at each day, the time you’ve spent. Do all your yesterdays look alike? I know there are things we have to do. Many of us hold full-time jobs, we have young children to care for, and school activities. Some of us actually prepare and eat our meals at home. There’s grass to mow and clothes to wash. By the time we have a quiet moment, we fall asleep, or we’re too tired to think. I could say “this too shall pass” because it will. It’ll be our yesterday. I don’t believe in putting our writing before the family so somewhere between putting the youngest child to bed and tossing the whites into the washing machine, can you figure out the GMC (Goal, Motivation & Conflict) for that new idea that’s popped into your head? Snag it this time. Don’t let this idea get away from you. Jot it into the Notes of your iPhone, or download the Dragon Dictation app, speak your GMC and email it to yourself. You can always glue a magnet on the back of a light-weight notebook to keep on the fridge. Capture some of those brainstorms that pass through on their way to yesterday. A book or THE book? Do you have an idea that gnaws at your insides? Find time? Why don’t you MAKE time? What’s standing in the way of writing that book now? I don’t ask my questions, but I feel sad because often those people—regardless of age—will never write their book. They haven’t started the process: studying the craft, buying the how-to books, hanging with other writers in clubs or critique groups, attending conferences. Actually writing. Start now! I can’t say it enough. You’re not too young, too old, too sick or too busy. Start now! No matter how many or how few words or pages you write each day, it counts. It matters. It’s part of the process that puts you on the path to accomplishing that dream. I’d rather chase my dreams for fifty years and never catch them, than never chase my dreams at all. Is yesterday a sad word or is it my imagination? 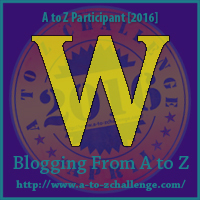 All through this A to Z Challenge, when friends and hubby ask if I have my post finished, I always say … “Working on it…” even if I’m just thinking about it. I’ve noticed I do that a lot… no matter what is being asked. “Working on it,” I say, as I walk past the kitchen and down the hall. “Working on it,” I answer, and pop another bon-bon in my mouth. “Working on it,” I say while sitting on the couch. “Working on it,” and accept a new FB friend. Working on it means nothing to me. Sort of like when you asked your mama if you could go skating next Saturday and she said, “We’ll see.” My kids knew that we’ll see usually meant no. If there’s one thing I’ve learned during this A to Z Challenge, it’s that waiting to the last minute to write a post can introduce us to bad habits. I think working on it might be one; it’s my procrastination phrase. It’s a way of making myself sound busy—even when I’m not. My rationalization is that by writing our posts late, we train ourselves to think and create fast. It works. But when it introduces us to bad habits, beware. 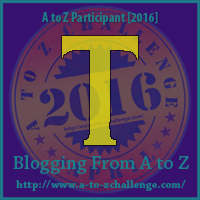 What have you learned during this A to Z Challenge? Developed any bad habits? 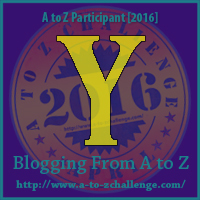 Our 2016 A to Z Challenge is almost over. It went fast. Today our letter is V. I decided to have some fun with various V words. For instance, I can’t get the word vitamin out of my head. I keep thinking about how there are so many nutrients the body needs—whether we get those nutrients from vitamins or natural foods. So it is with our writing: we need instruction, feedback, brainstorming and encouragement from other writers and if we don’t get those things, it’s akin to deficiencies and can produce specific disorders. We writers like to say we’re lonely but friendships abound—online and off. 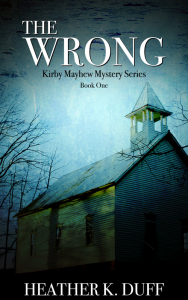 If we’re venturing through the writing and publishing world alone, something’s wrong somewhere. There’s also the word village. I’m not completely on board with “it takes a village to raise a child” unless it’s a healthy village that consists of parents, grandparents, aunts, uncles and cousins. However, writers are a little different. We need our village of friends, encouragers, promoters, beta readers and more. And it, too, needs to be a healthy village—no negativity or jealousy. I hope we’re all lucky enough to have a few veteran writers walk through the valleys with us. They know how to keep us on track because they’ve been in the valleys too. They can remind us to hang on to our vision. If we receive affirming vibes from authors we respect and admire, the variety and volume of work we turn out is tremendous. There’s no room for villains in our line of work—but we have fun writing them! This was a fun post, but serious too. It made me think about you, my visitors. If I could give each of you gifts today, they would be validation that you’re a writer and victory over all the negatives in your life. So many writers these days are still—yes, still— wondering whether to become indie published or to hang their hats on getting an agent that will sell them to a traditional publisher. We’re undecided because whether we want to believe it or not, there’s still a stigma on indie publishing. Many writers refer to it as self-publishing. Just a few weeks ago I heard a multi-published author say such a thing with derision in her voice. Yes, sadly, that stigma comes from other writers—our peers. Why? Because we writers have a lot of pride, and to be honest, we’re snobs when it comes to our publishers, our agents and our writing. Self-publishing has always been the underdog in the publishing world, even though we all know there have been some very successful self-published books. Self-publishing has always been associated with vanity publishing. 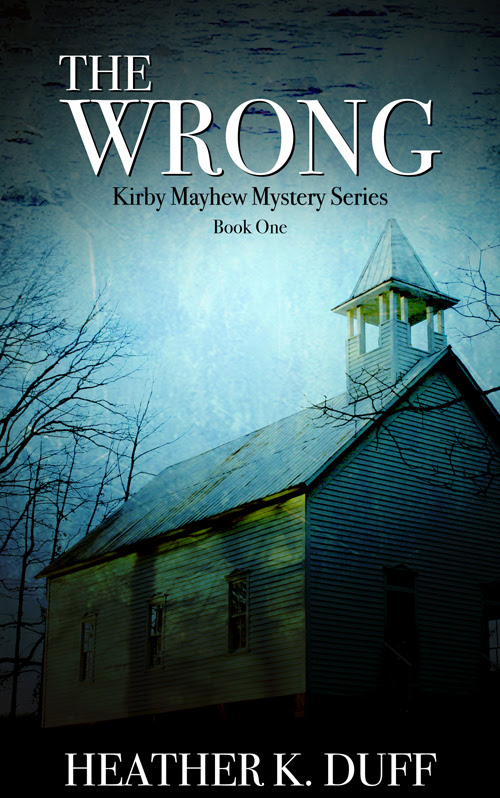 The phrase ‘vanity publishing’ even sounds hateful, doesn’t it? The term “indie writer” usually means a writer who is totally independent, one who buys their own ISBNs, determines their cover, their release date, everything– and maybe even starts their own publishing company. They’re dependent on no one but themselves. Regardless of definitions, the fact is you should never let labels influence you when it comes to achieving your goals and dreams. If you wrestle with whether you should go indie or traditional, the truth is: you should do both. Readers are our best friends. They don’t often know the different publishers or even care about them. They want good stories and great characters they can identify with. Make them happy with a fantastic story or series, and they’ll follow you anywhere! Traditional publishers have editors, cover artists, proof readers and publicists, to name only a few who are involved in the production of a book. As an indie writer, you’re taking on each of those jobs yourself—unless you hire some contract freelancers to do it for you. My main point is: don’t be undecided when it comes to your writing and publishing career. Don’t let labels discourage you. Be intentional, but do yourself a favor: Fulfill your responsibility to your reader and make all writers proud. How do you define indie publishing and self-publishing? Have you set your heart on traditional? Tell us your story. We writers are always talking to ourselves, and many times chastising ourselves for mistakes made along the way, taking a wrong turn on our career path. But in this business, there really isn’t a wrong turn. We can spend a lot of time second-guessing ourselves but I think success depends on many things that are out of our control. Of course, your idea of success and mine could be different. Sometimes we ache for a do-over, or at least a chance to warn or advise our younger self. When I interview I often ask a successful writer what she or he would say if they could go back and offer wisdom to their younger self when they were first beginning. I’m paraphrasing answers and all names are withheld. One author said he would tell himself to write to the market. That’s advice you don’t hear every day. He’s based his reasoning on hearing a number of agents say they take new clients solely on whether they can sell their books, with little consideration given to how good the book actually is. Another best-selling author takes the opposite approach. She would tell herself to write the story that needs to be told, not the one that would please agents and editors. We can sort of tell where these two are coming from, can’t we? Both answers sound laced with a little disappointment. Another said she would have looked for more opportunities to interact with other writers and industry professionals, because no one else understood her dreams. Be dogged, have the courage to write through the fears and angst that writers encounter when they write from their hearts, said another. Wisdom spoke when one author confessed she would tell her younger self not to compare her writing or herself to other writers because someone will always have more contracts, more published books, better covers, a more coveted publisher and better sells. When I try to visualize meeting the young me, the me with stars in her eyes who believed without a doubt she was going to become a best-selling author by the time she was 30, I think I’d just say go for it, girl. I wouldn’t want to change much and I sure wouldn’t want to discourage her. If you could go back and talk to yourself when you were a beginning writer, what advice would you offer? And on another note, what kind of self-talk do you indulge in? Day 22 (if you don’t omit the Sundays!) 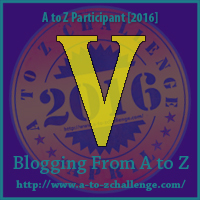 of the A to Z Challenge. It’s S-Day. Have you ever closed your eyes and listened to a movie or sitcom on TV. It’s an interesting exercise for your writing. Doing so gives you a completely different take on what you were watching. Dialogue becomes crisper but the sounds of movement and activity really activate your imagination. Have you ever noticed the sound a shovel makes as it digs into the earth—over and over again? Ominous. Ever thought about how to describe that sound in your writing? Remember, we want to show, not tell. What about Silence? Remember The Sound of Silence by Simon and Garfunkel? Silence can be pretty noisy when we’re completely alone and feeling scared. Or when we’re angry and refusing to talk. How do we write it? Successfully using the senses in our writing bumps our writing to a higher level; our books and stories come alive for our readers. Sensory writing is probably one of the most important things we can learn how to do. I struggle with it and have to make several passes through a manuscript to utilize all the senses. I’ve read that by using the senses and being descriptive, we’re adding a layer of honesty and believability to our writing. Of course, it has to seem natural–not forced. Painting pictures with our words can be challenging. Just for fun, don’t watch your favorite sitcom, listen to it. Make note of the different sounds you hear and try to effectively write them. Also, here’s a link that will allow you to listen to the shoveling of dirt, snow, gravel, and glass. Do you find descriptive writing difficult or is using the senses natural for you? 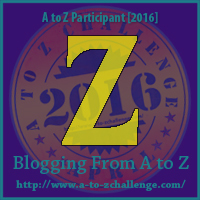 We’re 21 days into the A to Z Challenge. Hard to believe the month is almost over. 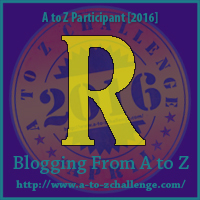 Today is R day and the word Rookie popped into my head (with hubby’s help). We don’t often think of new authors as rookies, but if they’re inexperienced, a novice in the field of writing and publishing, they are. One can be published and a novice–as odd as that seems. I know some rookie authors. Time and time again, I see them doing something a little strange. When their season is over, they don’t let go of the rookie title. One lady I know has a couple of self-published books under her belt. In my mind, she’s still in the rookie camp because she’s upset that she can’t enter contests for unpublished writers. She sees them as valuable because they are judged by editors and agents. The rules dub this lady a pro because she’s published. I want to say hey, what do you want to be—published or unpublished? Another self-published friend tends to kowtow to the multi-published/traditionally published, as if she knows nothing. She’s not wearing her “published author cape” when she’s around other authors. Why? If she knew enough to self-publish her book she should stand tall and proud, and act like the professional she is. The word rookie isn’t synonymous with the word doormat. I think the problem here is that these rookie authors (both self-published) might not feel like real authors because they are self-published. They don’t believe in or respect what they’ve done. Could I be wrong? We’ve all been rookies. And it’s scary to think each book needs to be better than the one before. Writing a good book isn’t easy for any of us. Some writers say it gets easier the more we write; others say no, it gets harder. Whatever the answer is … enjoy your season as a rookie. In sports a rookie card is a trading card that’s the first to feature a specific athlete. Collectors value rookie cards. Rookie authors, you are valued. Act like it! Do you have words of encouragement for rookie authors? Or, do you think I’m totally off in my assessment? Feel free to set me straight.